This was our 4th annual golf trip with Beach Reunion to Destin. We love the courses in Destin and your homes are great. Every guy had his own room. We really enjoyed the private pool area along with the Hot Tub. It was just a perfect 4 day getaway in April. We loved the restaurants Flemings and the Bonefish. We enjoyed the private in home Chef you recommended, She did a crab boil and grilled steaks for all of us poolside at the house. They served us and did all the clean up what a wonderful experience that was..We are looking at making this a semi-annual trip next year during football season; all we need to do is convince the wives. One guy suggested we send the wives on the Beach Reunion Ladies Spa and shopping package..Thank you again so much we look forward to seeing all of you again. This Venus house was worth the 12 hour drive from Mansfield, Texas. This house was so nicely designed and we had a great Thanksgiving all together. We had not been all together in years, we definatley will all come meet together here again. The clock is striking 12 and life is turning back into a pumpkin..We all thought that the house was beautiful and perfect for our large family. The location was perfect and we all enjoyed our private pool, hot tub, the beaches and the large kitchen was really enjoyed. Family love was shared & memories were made. It was a wonderful time. This was our second visit to the Beach Reunion homes and it will not be our last. We love all the space your homes have to offer for our large family. It is so nice to stay all together and play games, swim in our private pool, and laugh the evening away. We had plenty to celebrate this tripA first birthday, a marriage, and a new engagement. We celebrated with lots of food, fun and family. Look forward to seeing you next year. The house was absolutely perfect. We had 24 people here and nobody got their feelings hurt and we experienced no loss of life !!! Now that is a successful vacationThank you so much and we will see you again next year. We had a Great Time and Your house is wonderful ! The jellyfish were in and that was horrible but we made the best of it. We celebrated a 25th wedding anniversary and a Birthday during the week. We were with great family and friends and we will always remember this week. We cant wait to return to the beautiful Beaches of Destin. It was amazing staying in your home and all our familys under one roof. Having your own private pool has spoiled us forever we will be back as soon as we can. We love your houses ! This is our second time staying in your homes and we had a wonderful time once again. Thanks for Great Memories and Great Times..See you next year . This past year has brought many sorrows with the death of some loved ones. With in the walls of your lovely home our family has come together and realized to express our love to one another while we can. We now have a new engagement, a new baby, a marriage to look forward to. This week as the Venus has shared its great beauty with our family we leave with a renewed outlook. The family has shared some great memories within these walls, we feel as though it is a second home. Thank you for sharing your home with our family and we will be back next year. Thank you for renting such a beautiful and large home it made our reunion better than we could have imagined. We were all able to be together but not all on top of each other, plenty of room to spread out. Thank you for a perfect week with our family and friends ! The Venus house was awesome and a perfect fit for us to celebrate our 35th Wedding Anniversary. We were so blessed to have found Beach Reunion and will continue to come back each year. Your Santorini house was absolutely amazing and our guest were more than comfortable - more like BLOWN Away. The layout was perfect for our needs, as the Bridal party occupied the entire third floor, so they had complete privacy the day of the wedding. The pool and the jacuzzi were just the ticket for those of us that just wanted to relax. The Santorini could not have been a more perfect house for us. There is no question we will be renting with Beach Reunion again. You ladies were absolutely amazing the way you tended to our needs and helped us out with parking on the day of the wedding. The weekend was truly perfect. THANK YOU..
Everything we could have asked for and more!!!.. I am a local girl who rented this house for my wedding party to stay in and to hold the reception. Everything was absolutly perfect. The house truly felt like you were living in a Mansion for a few days and provided a beautiful backdrop for the wedding. Everyone in our party RAVED about the house and it had been the best vacation they had ever had. 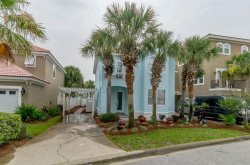 Trust me you wont regret renting this house and you will love working with the Beach Reunion Team! Our group is going to make this a yearly thing. We just booked our 4th trip with Beach Reunion. Every house we have stayed in has been top notch. All the houses are close to the beach and are fully loaded. We wouldnt think of booking with anyone else. If you have a large group there is no better team to work with than Beach Reunion. What a beautiful home. We vacationed here with my husbands family. In all, there were 20 of us. There was more than enough room. The bunk room alone can sleep 7 people. There are so many things close by, you dont have to worry if everyone in your group is not a beach bum. Seaside is less than 10 minutes away. The Red Bar is right around the corner. Destin is about 10 miles east. And much more in walking distance with a great walk/bike path and a place to rent bikes within walking distance of the house. The walk to the boardwalk is very short, but there was a golf cart available to assist in getting all of your "stuff" to and from. And, there are also beach chairs and an umbrella available to renters too. What a nice bonus -- not to have to rent the set up for the week!! Overall - I rate this house a 5. P.S. LOVE, LOVE, LOVE the outside refrigerator. What a lifesaver. First house Ive ever stayed in that had a full size refrigerator for extra drinks, milk, etc. Well be back!! I wanted to thank you for all of your help and for the beautiful penthouses! My wedding was amazing and couldnt have asked for a more beautiful place to start our lives together as husband and wife. Everyone we encountered were so pleasant. Curtis, one of the gentlemen from the cleaning crew even sent me flowers! Your graciousness as well as Donnas was much appreciated. Please let Donna know how thankful we are. I had the pleasure of booking our Annual Live, Laugh Love Retreat for The S.U.I.T.E. Society this year through Beach Reunion. It was a total of sixteen ladies this year. We stayed at the "Santorini". What a house to stay at! It was VERY roomy for all of the ladies. There wasnt a complaint at all. We enjoyed the private pool area at night and during the day. The open living room/kitchen areas on the first and third floors was a great spot for our group discussions. The look on all of the ladies faces was priceless upon arrival and choosing their rooms. There wasnt a bad bed in the house including the custom bunk room. The ice maker was a huge hit for our cocktail hours. We LOVED that great shopping, a variety of restaurants was near and being just a walk from the beach! Upon departure we were not ready to leave at all. The "Santorini" is a great house for a family gathering or any type of group trip. We will definitely be returning again for another great stay. Thanks a lot Beach Reunion!!! REVIEW TAKEN FROM VRBO: "Four moms and 11 kids aged 13-under had a wonderful time at Low Key and there was more than enough room for all of us. The location was perfect and we enjoyed the semi-privacy of the beach. We moms loved that we could allow the kids to go down to the beach and could watch them from the pool deck or the upper level balcony while we were having quiet mom time in the mornings and evenings. We saw many dolphins from the upper balcony the first four mornings! The boys really loved the bunkroom with four double beds. The lower level kitchen area was a great place for the "beach snacks" and drinks so we werent tracking sand throughout the rest of the house. The only negative would be that the pool is not heated (we stayed late March/early April). We LOVED Low Key and its location and will DEFINITELY make a return visit!"